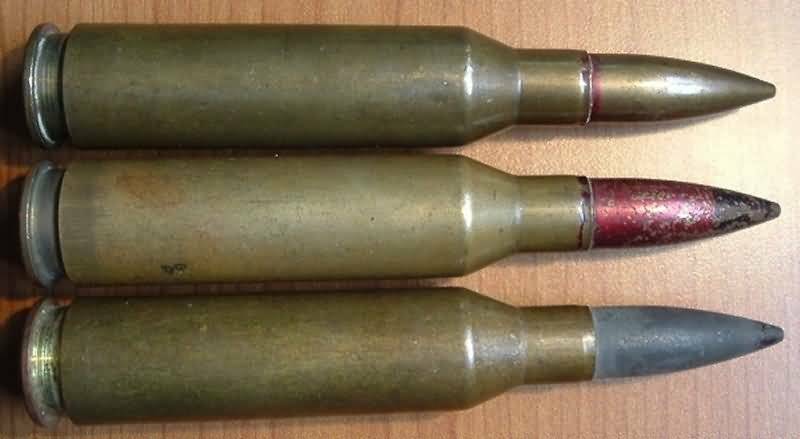 This cartridge has its origins immediately prior to WWII when in the Soviet Union it was decided that an infantry based anti-tank weapon was needed. As a result, the PTRD (single shot) and PTRD (gas operated with 5 round clip) rifles were developed in 1941. By 1944 the anti-tank rifle was obsolescent and the cartridge was used in the new KPV heavy machine gun. This weapon remains one of the most powerful platforms in the HMG category. The projectile has a muzzle velocity of 1,000 m/s and in the anti-tank rifle role the projectile was to penetrate 20mm of armour plate set at 20 degrees off the vertical at 500 m.
The early anti-tank loadings consisted primarily on the flat based tungsten cored BS.41 with incendiary component. These rounds can be identified by brass cases, early 1940 dates and blackened primers. Bullet tip markings can consist of no colour or all red bullets with black tips. Cases manufactured in 1939/40 were very heavy walled. By 1941 a thinner walled case was adopted. Brass plated steel jackets were used initially with zinc plating being adopted as an economy measure. The following 3 rounds are of this early variety. The earliest is headstamped 3 * 42 and did not have a tip colour, but has a red case mouth seal. The next round is headstamped 3 * 43. The third round is headstamped 3 * 44 but does not have a black primer. It has a zinc jacket and what appears to be remnants of a black tip (but no red). Post war production as a HMG round was reasonably widespread and there are several loadings. While production was primarily limited to countries in the Soviet/communist sphere of influence, it was also manufactured by FN in Belgium and tested experimentally in the USA . The following API loading is of Chinese manufacture. The case is lacquered steel. The projectile has a black tip and a brown mouth seal. The headstamp is 9901 81. This is the Type 56 and the colour coding was adopted in 1967. Prior to 1967, this load would have been identified by a black tip over red band. Reference: by P. Labbett and F.A. Brown, echnical ammunition Guide, Series 3, Pamphlet 4, 12.7 x 108 and 14.5 x 114 Ammunition, . 1990. pp. 12-21.